Mainly found in Scandinavia, Viking boat burials are as rare as they are fascinating. The ones that have been archaeologically excavated in the UK were unearthed on the isles, like Orkney, Shetland and Man. The only boat burials found on mainland Britain were discovered in the 19th century and were excavated, if you can call it that, outside of archaeological protocols. Few artifacts from them have survived and it’s difficult to confirm that they were in fact boat burials. The discovery of an intact Viking boat burial in Swordle Bay on western Scotland’s Ardnamurchan peninsula in 2011, therefore, was a momentous one. The Norse were known to have been in the area when they were still raiding and exploring the British Isles in the 9th and 10th centuries, before they founded any settlements, but this is the first archaeological evidence of their presence. 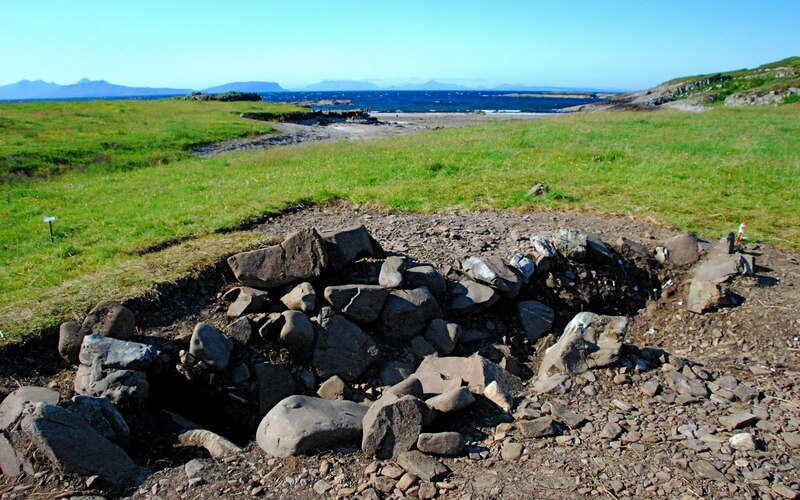 The grave was first identified in 2006 as part of the Ardnamurchan Transitions Project‘s survey of potential archaeological sites in the area dating from the Neolithic through the 19th century. 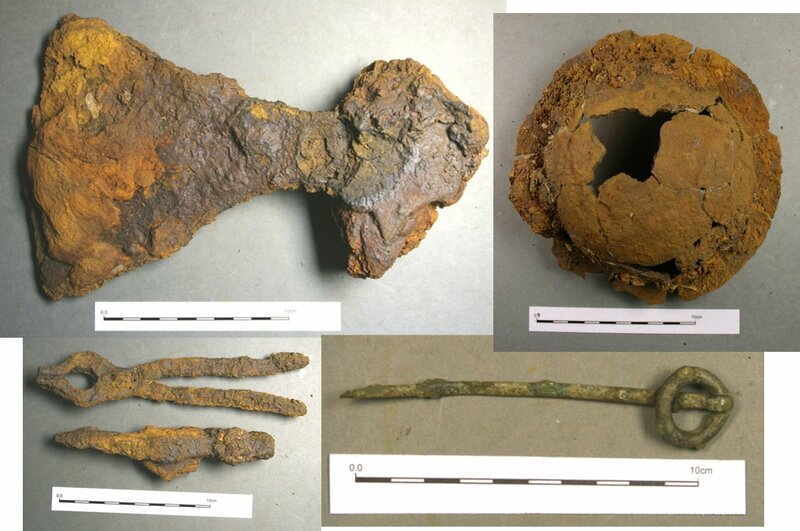 The ATP team dug a test trench across the low turf-covered mound and found stones collected and placed by human hands, as well as a rove, a metal plate or grommet that rivets pass through in boat construction. The dating of the mound wasn’t clear. Possibilities included Bronze Age or medieval origin. Full excavation of the mound would have to wait until 2011. Just under the topsoil, archaeologists found a spread of stones. Some of them were undisturbed, still placed where human hands had laid them centuries earlier. Others were scattered around the main stone pile and bore plough marks suggesting they’d been dislodged during later agricultural activity. Once the soil and fill were removed, the stone feature was revealed to be an oval outlined by kerb stones embedded in a cut. A spear head and a shield boss were found on a cairn stone underneath the silt layer that overlays them. 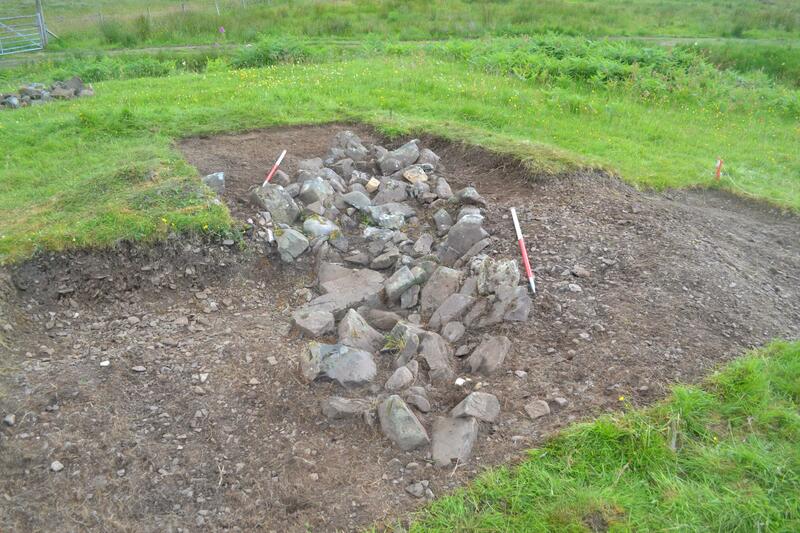 That suggests they were deposited around the same time as the stones, like at the time of burial, but that can’t be confirmed because the cairn has shifted significantly over time. Under the stones were layers of decayed organic material and a wealth of artifacts, among them a large iron pan with a handle three feet long, a ladle, the copper-alloy top of a drinking horn, more than 200 rivets and roves, a sword decorated with silver and copper wire with textile fragments wound around the blade, a broad-bladed axe, a copper alloy ring pin likely of Irish origin, a Norwegian schist whetstone, and an iron sickle. 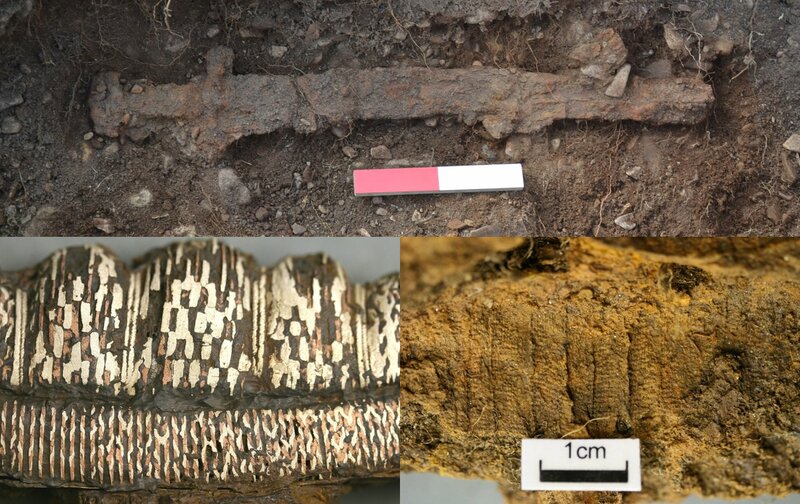 The rivets and roves, the sword style, the whetstone, the pointed oval boat cut and the organic decay likely from wood confirmed this was a rare Viking boat burial, the only one on the British mainland excavated to modern archaeological standards. The boat was about 5.1 meters (17 feet) long, a small rowboat, not a seafaring vessel. 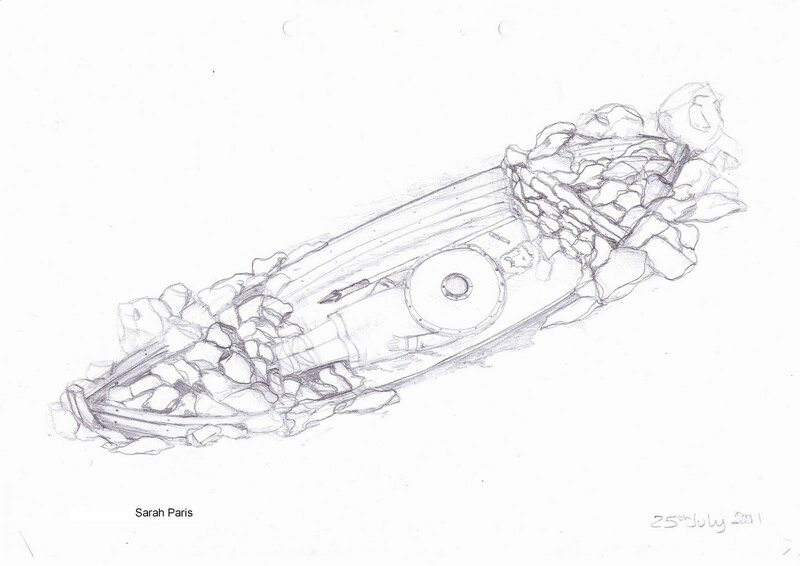 It was placed in the boat-shaped cut, the body of the deceased placed in the boat and then surrounded with grave goods. Rocks were piled atop the body, creating a burial mound. Preliminary analysis of the finds dated the burial to the late 9th, early 10th century. The weaponry suggests the deceased was male, but the pan and ladle are more typical of female burials. 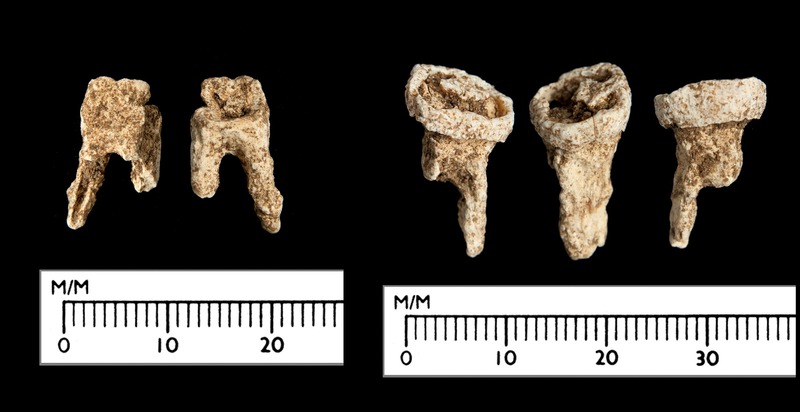 A small fragment of bone and two teeth are the only human remains discovered in the grave, neither of them sufficient to conclusively gender the burial. The latest report on the findings has now been published in the journal Antiquity. Strontium, lead and oxygen isotope analysis was done on the teeth to determine the deceased’s diet between the ages of two and 15 and thus a possible national origin. Results showed that the person ate a land-based diet until he or she was 15, with a boost in seafood consumption when the individual was between three and five years old. Marine proteins were rarely consumed in Britain during the first millennium A.D., even for people who lived on the coast. In Norway, on the other hand, people ate plenty of seafood, although children less than adults. The fact that this person ate so much fish during that brief period as a small child suggests there may have been a food shortage that pushed the locals towards additional marine sources of nourishment. The stable isotope results exclude the deceased coming from the west coast of Britain, from western Britain in general, western Ireland or the Northern and Western Isles of Scotland. Other parts of Ireland are still possible candidates, but the likeliest is Scandinavia. When we consider this burial, what can we say about identity? At least three terms could potentially be used to describe the deceased: ‘Norse’, ‘warrior’ and ‘high status’. Evidence for the first of these comes from the boat and related connotations of travel and voyaging; from the material culture from Scandinavia and Ireland; and from the surviving teeth. Even though a definitive place of origin cannot be proven from the isotope evidence alone, when combined with the material from the grave itself a Scandinavian homeland is suggested; Ireland cannot, however, be ruled out. The evidence for a warrior identity lies, of course, in the weapons, although this imposes a traditional assumption that grave goods belong to the deceased and directly disclose their identity. Finally, the whole assemblage–the artefacts and their elaborate interment–suggests a notion of high status. The fact that a person of such high status deserving of a boat burial with rich grave goods was interred on the peninsula may be a significant marker of the transition between the Vikings as raiders of Britain and the Vikings as settlers. The warrior’s final resting place could indicate the first settlement of the area by the Vikings–indicated by Swordle Bay originating as a Norse name meaning ‘grassy valley’. “I don’t think they are just sailing up and down the coast, someone has died, and they have just rowed into the nearest harbour and buried someone there,” Harris said. “There is a kind of connection to this landscape that is more substantial than that. This entry was posted on Saturday, February 11th, 2017 at 10:54 AM	and is filed under Medieval. You can follow any responses to this entry through the RSS 2.0 feed. You can skip to the end and leave a response. Pinging is currently not allowed. I thank you for all your excellent and highly interesting articles. Hence, a few more Southener’s skull drinking cups had to be collected for Odin’s table – AND – the transition between Viking raiders and settlers had to wait. Cold north winds under the sky’s gray arch tell Nørdmenn where duty calls them – South to Sunny Italy ! Btw, Odin recommends: Keep the wordpress theme as øldfashiøned as possible, ‘valhalla‘ or something. A friend of ours has a cottage in Appin, which has a wet climate like Ardnamurchan’s. Her water too comes from a spring. But it dries up quite often in the drought of May or early June, when the easterlies blow so that the West Highland coastal areas are in the rain-shadow. I call those easterlies ‘Viking winds’ because they are probably what brought those naughty boys from Norway.